Like many red blooded American boys, I was big into pocket knives before growing old enough for the firearms bug to take hold. It's a fascination you never really grow out of I think. Over the years I've owned, broke and lost quite a few folding knives. It's because of this quick turnover that I've always been hesitant to invest in a nicer quality knife. My budget was typically the cheaper blades you'd get at Christmas or from a big box store for under $50. Usually a Gerber, or a Buck knife. Well finally I convinced myself to step up my EDC knife game. I bumped my budget up to the $100-$200 dollar range and was looking for a folder that had high quality steel that wouldn't need sharpening so often, and an easy opening mechanism. Obviously being in the gun and knife community for awhile, you hear impressions and recommendations from other folks. I kept hearing about the Griptilian and it's little brother the Mini Grip and how they were a great all purpose folder well suited for everyday carry and capable of handling some abuse. The Griptilian is one of Benchmade's best sellers, and I figured I needed to pick one up myself. If purchasing from Benchmade's website, you can pick from all the customization options to design the knife exactly how you want, a lot like picking out a new car. Grip material, grip color, blade steel and finish, blade style, even custom engraving options. Of course, you're paying full price going thru the manufacturer's... but you get exactly the type of knife you want. I went the more frugal option and bought my Griptilian at a gun show. I highly recommend this option for those who aren't too specific on their color options, and want to save more than a few bucks. The Griptilian has been out for quite a few years now, so being older its very easy to haggle with vendors and talk them down to a lower price, especially if A: you are buying more than one knife, and B: if its the last day/hours of the gun show and they are a little more desperate to move inventory. If you can afford to pay full price on the principle of supporting local small businesses, thats fantastic also. Just be aware that buying from a gun show booth, you are obviously limited by the stock on hand, so be prepared to compromise on handle color and other aesthetic options. 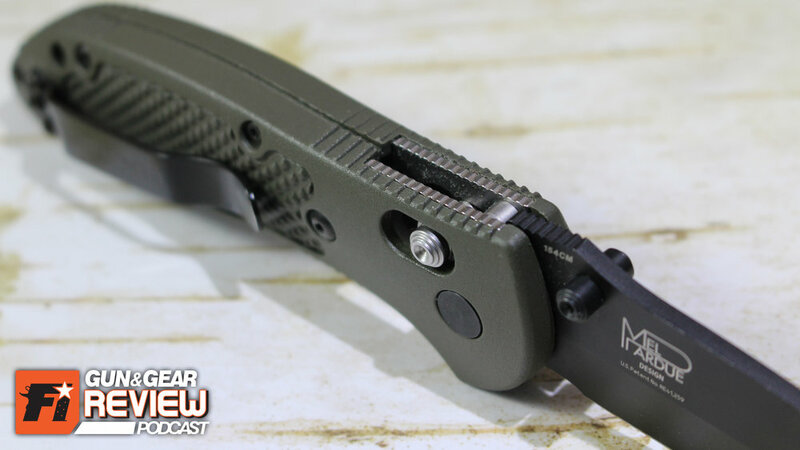 So I picked a black coated Tanto blade style 'Grip' with an OD green handle. I chose the Tanto because its design makes for a stronger tip, and I usually end up snapping tips on drop point and sheepsfoot style knives in desperation while doing a task with the wrong tool. Plus this is a knife I've added to my EDC gear (Que obligatory pocket dump instagram photo!) and a Tanto is a very capable defensive blade design. I didn't pick the Tanto for the express purpose of stabbing or shanking bad guys, although really the only benefits are its advantage in perforating tough materials like sheet metal, and skulls of course. As well as working well as a make-shift chisel when needed. When it comes to slicing jobs, drop points are more versatile because they have a belly.The Tanto design has two flat edges and zero “belly” to the blade, making tasks like slicing more difficult depending on the medium. Plus, drop-point style blades are MUCH easier to sharpen. Tantos have two angles to sharpen, and it takes some practice to perfect. If I had to repurchase my 'Grip,' I would go for a traditional drop point instead. That said, I like the Mel Pardue design and the 154 chrome moly steel Benchmade uses, and it holds an edge pretty well compared to lesser knives. Most knife owners complain about their knifes getting dull, and its because they LET the edge get dull. These aren't lightsabers folks, and until adamantium becomes a real thing, all knifes will require sharpening as simple maintenance. With better quality steels, the more you let the edge dull, the harder it will be to return to that razor sharp edge. So if you use it regularly, you should maintain that edge regularly also. Its the AXIS lock mechanism thats the shining feature of the Griptilian. The release itself is ambidextrous, and is raised for easy manipulation. The edges of the AXIS release are a bit sharp. I've heard of some users using an emery board or other buffing tools to knock down that edge so its not as aggressive. While it can be slid down from one side, pulling down on both sides of the release is more efficient. This is ironically because of the physical axis the release tilts on when you only apply downward pressure from one side. The travel distance needed to release the lock is actually pretty short, so it doesn't take much effort if you are wanting to 'flip' the blade out one handed with a flick of the wrist. The blade can also be deployed using the thumb stud. The studs are sizable enough to wedge the tip of your thumb under and flick outward, without being obnoxiously protruding. If the traditional slow and safe way is more your speed, its easy to pivot out with your thumb on the stud, and then by pulling down on the release and closing the blade manually. 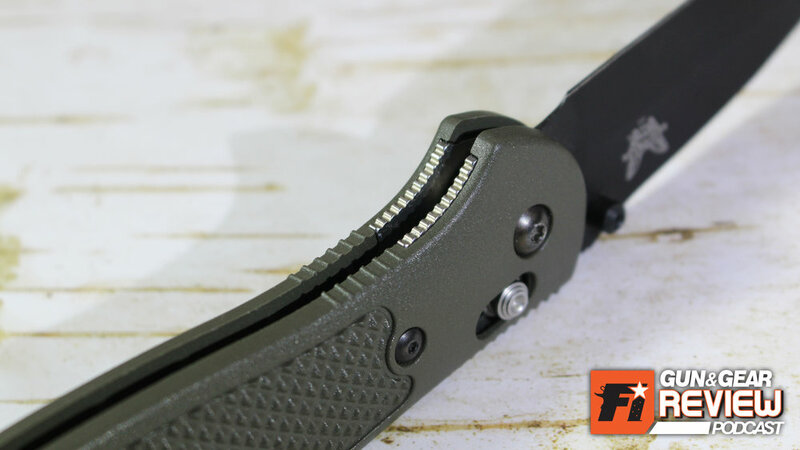 If you want to be fast and dangerous, there is the 'AXIS flick' method of opening the Griptilian by only using the inertia of a quick flick of wrist while holding down the AXIS lock release stud. This way will make you more friends around the water cooler, but is also a great way to cut yourself if you don't know what you are doing. Too much momentum might cause the blade to bounce if the AXIS stud is still being held down in the unlocked position. This goes for either opening or closing the blade (see end of video). Releasing the stud at the right time ensures the blade is held in the correct position. Just be warned this isn't the manufacturer's recommended operation, and you could be prematurely wearing your knife's internals prematurely by doing this too often. The grip texture on the sides of the nylon handle is a bunch of pyramids in an area roughly about the 60% of the whole handle. There is also nylon jimping on the spine side and blade sides. The overall swell of the handle I found pretty ergonomic in the hand, and I wouldn't wish it bigger or smaller personally. There is a big difference in handle width and feel if you go with a G10 handle, as they are panels rather than a nylon housing. I do like the nylon because its closed in the rear to keep out pocket lint and other debris, but it can snap with enough force applied (don't run over it or land on it in your pocket). The metal inserts inside the handle have jimping as well, on the back side and the front near the pivot point. This is ideal for stabbing tasks, as well as cutting like you would with an Exacto knife or carpet knife. I found them textured enough for a firm purchase, without being too abrasive for bare skin. The clip on the Grip is reversible for left or right hand pocket carry. Either way it leaves the folded blade's tip pointing up. You can't flip the clip to reorient the tip (thank you, thank you). But it would be very awkward to pull from your pocket in any other direction. For self defense, the knife can still be drawn and deployed easily. While its not setup to catch on the pocket and deploy all fancy-like an Emerson Wave design, its still a solid action for reacting to a threat. In my time period with the Griptilian, I was pretty surprised by its robust construction. You could get away with a fair amount of stabbing, prying and reckless twisting with this knife in the Tanto configuration. It does have it's limits, but so far I've been surprised how much abuse the Grip can withstand... unmentionable things that I wouldn't dare subject a lesser knife to do. So far the Griptilian has been a fantastic EDC knife and I would happily repurchase it again (but in hindsight, probably get a drop-point blade instead). Claim to Fame: When it comes to all around functionality, you can't beat the Griptillian! What other aesthetic options or finishes are available? : Satin or Coated Blade; Grips come in Nylon or G10, in Black, Olive Drab, Sand, Orange, and Gray.